Representing a new way of thinking about guitarists and technology, Helix is like no other guitar processor that you’ve seen before. Immense care was taken to assemble a palette of tools that would let musicians quickly recreate the sound they hear in their head, without sonic compromise. 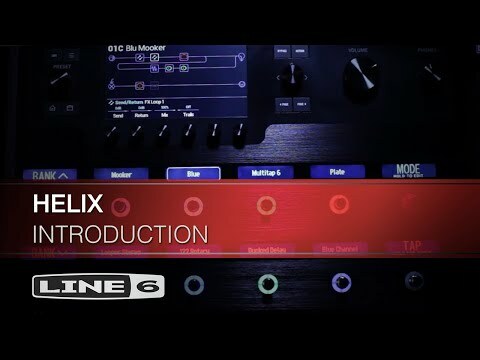 When it comes down to authentic sound and feel, Helix represents a giant leap forward for guitar technology. The dual-DSP engine provides massive power to accurately recreate the dynamic feel of tube amplifiers, not just their sonic fingerprint. Each stage of an amp’s circuit has been measured and matched back to the original, so that each model reacts and interacts just like the real thing. This level of dynamic circuit detail extends into areas like power supply ripple, individual tube sag, and control over B+ voltages. Once these elements are captured, you get classic bloom and gooey compression on some amps, and a powerful gut punch on others. Massive power traditionally comes with a steep learning curve, but Helix challenges that way of thinking. Touch-sensitive footswitches allow you to select an effect block or other item for editing simply by touching it. In combination, the large 6.2 inch 800x480-pixel LCD display all but eliminates menu-diving and provides the same level of control you might expect from an external editor. Colored LED rings and customizable scribble strips complete the user interface, letting you know what each footswitch is doing at a glance. Helix was designed to allow guitarists to interact with technology in ways that are more intuitive, making the creation of tones easier. This means that—for the very first time—you won’t have to stop playing to tweak a knob. With Pedal Edit Mode, you can edit any amp or effect parameter you like using your foot: simply select the block that you want to tweak, and its parameters spill out onto the footswitches. Select a parameter, and tweak the value using the expression pedal. Helix is the fastest tone creator of its kind, giving you the ability to touch a footswitch and quickly tweak parameters or easily assign or learn controllers. Instantly jump to any block simply by touching the associated footswitch. It’s so fast you can comfortably assign any item to a switch in 3 seconds. When you need to incorporate external devices via MIDI, Helix offers more flexibility than any multi-effect ever. In addition to powerful real time MIDI control, Helix can send up to six separate commands at patch recall that aren’t assigned to a footswitch, which means you can change a patch on a synth, start a sequencer, and turn up a fader on an external digital mixer, all with one press of a footswitch. Add two additional expression pedal inputs, CV/Expression out, and external amp switching, and Helix can be the command center for any size rig.